Goa was conquered by Albuquerque in 1510, and became the capital of the Portuguese East Indies. Churches and convents were soon built. In 1542 the Jesuit missionary St Francis Xavier (1506-1552) arrived at Goa. The most comprehensive group of churches and cathedrals built during 16th to 17th century AD at Old Goa comprise of the following : Se Cathedral, Church and Convent of St. Francis of Assisi, Chapel of St. Catherine, Basilica of Bom Jesus which contains the tomb of St Francis-Xavier; Church of Lady of Rosary; Church of St. Augustine. 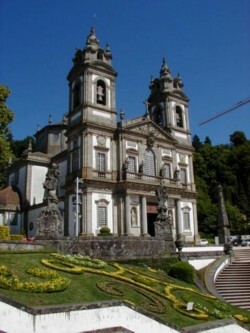 The Church of Bom Jesus with its facade decorated with Ionic, Doric and Corinthian pilasters, shows the application of the Classical order.